The pups are back, but this time they are celebrating Thanksgiving, Plymouth-style as Pilgrims! Be creative with this coloring page – use it as a count and color activity, use it as an ice breaker activity for being thankful, or come up with an angle of your own. Looking for more Thanksgiving printables? 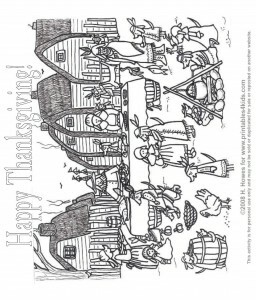 Check out our selection of Thanksgiving coloring pages, word search and word scramble!